How many calories in chicken? Each of the different cuts of chicken vary in their calorie count. Additionally, the amount of calories will also depend on how the chicken is cooked. When cooking portions of chicken, consider removing the skin prior to cooking. Additionally, free range and organic chickens will generally have less fat. The recommended ways for low calorie cooking are stewing chicken, chicken from the rotisserie, and roasting chicken. Refrain from frying chicken where possible. The leanest part of the chicken is chicken breast which is why chicken breast calories are the lowest; not surprisingly the calories in fried chicken are the highest. 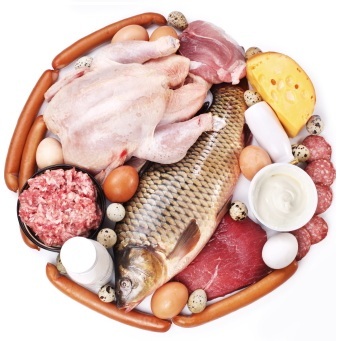 Also, the dark meat is higher in calories but it is a good source of iron. This yummy oven baked chicken recipe makes a perfect lunch as well as dinner and is also good for a special occasion. The recipe is low in carbs, low GI and high in protein, calcium, niacin and selenium. It is diabetes appropriate and gluten free. This easy chicken salad recipe takes only 30 min to prepare. It contains just 242 calories without dressing and 317 kcal with the ceasar dressing. The recipe is low in carbs, just 3g of net carbs for low carb high protein diet followers. 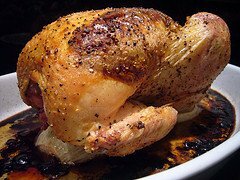 Also, it is low GI, high in potassium, calcium, vitamin A, B-6 and C.
This roast chicken is very easy to cook, full of flavor and very juicy. This recipe serves 4 people and will be enough for a family dinner and chicken leftovers can be used for other chicken recipes. The recipe is suitable for a low GI, low fat high protein and low carb high protein diet. A chicken roasted with rosemary and garlic, is very juicy and big enough for the whole family. The recipe is high in protein, niacin, selenium, phosphorus and vitamin B-6. It is suitable for a low GI, diabetic, low carb high protein diet. This simply delicious recipe can be cooked in just under 1 hour for your Sunday roast or weekday dinner. Ingredients: chicken thighs, lemon juice, garlic, basil and white wine. One serving provides 350 kcal and 3g of net carbs. This colorful soup is not only easy to make with chicken leftovers, but it is also a good source of niacin, vitamin A and C. You can also learn how to cook this soup with raw chicken. The recipe is suitable for a diabetic, low calorie, low carb high protein, low GI, low fat diet. You must try our low calorie delicious chicken fajitas with just 258 calories per serving. The recipe is low in calories, glycemic index, carbs, and saturated fat. It provides a good source of niacin, phosphorus, selenium, vitamins A,C and B-6. It is easy to make this soup with chicken leftovers from your roast dinner - it takes only 20 min. The recipe is high in vitamin C and niacin, low in calories, carbs, cholesterol, fat, glycemic index and sodium. This quick and easy Thai red curry only needs 30 min from start to finish. There are 373 calories in 1 serving. It is low in carbs, calories, cholesterol, glycemic index, good source of niacin, phosphorus, selenium, vitamin A, B6, C and is dairy free and diabetes appropriate.